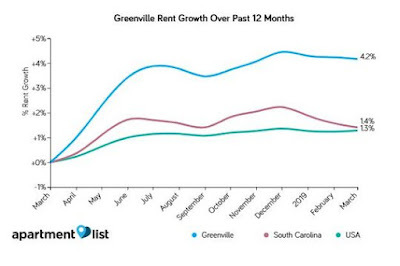 Greenville SC apartment rental rates have tripled the national average in a year! Apartment List has put out their rental report for April 2019 and it shows that nationally rents remained flat for the second straight month. Nationally, the year-over-year growth was around 1.3 percent which lagged behind the previous two years. Greenville SC has seen a boost in apartment construction, especially in the downtown area. One would think that with more units on the market, the rents would level off or become cheaper. But this is not the case. Although the median price for a 2-bedroom is $870, this is below the $1,170 national average. If you rented in San Fran it would be $3,110 a month. 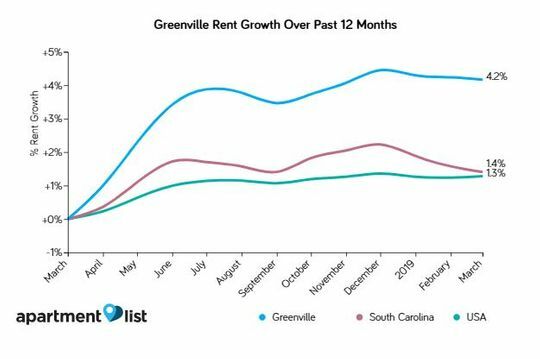 Apartment List’s April report reflects that rents in Greenville SC rose 4.2 percent from April 2018. Spartanburg came in second at 3.8 percent and Columbia was closer to the national average at 1.9 percent. Similarly, rents in Charleston for a 2-bedroom dropped two-tenths of a percent to $1,090. So, what could be driving this rental rate increase you ask? There has been an increase in business developments in the Greenville area over the last several years and with this increase comes an influx of extra people who are looking for or relocating to a new job and need housing. Most look for temporary housing such as renting to start. Also, homes for sale nationally as well as in Greenville SC has been an issue. Builders are starting to recover but are being cautious because many took a big hit during the 2007 crash. Rents will continue to increase. How do you combat this? Contact me today about getting you into a home where you can pay toward ownership and build equity in something that will pay off big for you when you need to sell.